Back in early January, I was in D.C. (technically, 35 minutes outside of the city) for a client business trip in the bean-counting part of my life. After working long hours during the week, my team and I were given the day off on a Sunday, so I decided to go into D.C. with my two friends, Angela and Krystal. 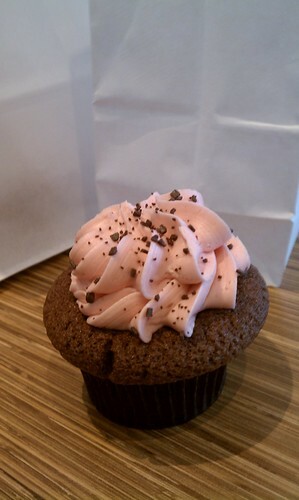 I made on request that we stop at this cupcakery located in D.C.'s neighborhood, Dupont Circle, called Hello Cupcake. What an adorable name! These were the flavors offered that day. 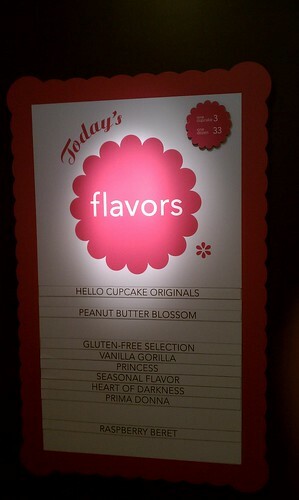 I'm a fan of their cupcake flavor names, especially Prima Donna, Heart of Darkness, and Raspberry Beret. I went with the Raspberry Beret, mainly because after having raspberry cupcakes from Butter Lane in the East Village, I've come to love raspberry buttercream! The Raspberry Beret is a chocolate cupcake with a sweet little cap of raspberry buttercream frosting and chocolate sprinkles. The buttercream was great--really light and not overly sweet. The cake was a little dry. 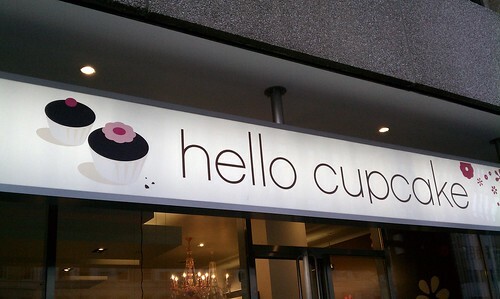 Findings: The cupcakes from Hello Cupcake look really cute! The buttercream I had on my Raspberry Beret was delicious, but as I said before, the cupcake part was a bit dry. I would definitely go back and try it again. It was a Sunday afternoon when I went, so maybe it was part of the day's last batch. Nonetheless, it was nice to make a stop at a D.C. cupcakery while away from home! Price point: $3 for one cupcake. Tags: 2011, American Traditional, bakeries, cafés, cupcakes, dessert, first visit, Hello Cupcake, Washington D.C. I'm sorta iffy on this whole cupcake bakery trend. If most of what you sell is cupcakes, they are going to be pricey cupcakes. And really, unless it is the best cupcake I have ever had or I'm stranded at an airport, I don't want a super expensive cupcake. Plus, it's annoying to get something from a bakery that's no better than what I could make with some Duncan Hines. To be honest, I don't really like cupcakes all that much--I just love ogling at them, haha. What I really am a sucker for are macarons, and for those, I am willing to pay a little more for because of the amount of labor that goes into making a small batch. But you're right. Cupcakes are overpriced. They SHOULD be the best cupcake you've ever had (for me, that's Butter Lane or ChikaLicious)! As you've said before, I think you and Anna should open up that bakery--you guys would make a fortune!